The mobile 3D market will hit critical mass in the next year or two. Here's what you need to know about this new market, the software standards and hardware developments for the technology, and how 3D computing will enhance the mobile experience. Three-dimensional (3D) computer technology has elbowed its way to a position of prominence over the past decade to emerge as a major force in the world of digital media. Thanks to its incredible adoption rate within the computer game industry, and an increasing presence on the World Wide Web, 3D is now pervasive on traditional computing devices. In much the same way that 3D is taken for granted by users of desktops, laptops and dedicated game consoles, the mobile computing industry is poised to experience a similar revolution. Although the hardware and software technologies that make mobile 3D possible are currently between five and 10 years behind traditional 3D in terms of overall capabilities, the mobile 3D market is maturing between two and three times faster than its predecessor and is on track to reach critical mass in the next year or two. Specifically, a new generation of hardware-accelerated mobile devices will soon be joined by a suite of emerging 3D software standards that gives developers the ability to create interactive content and applications that haven't been possible before. In this article, the first in a two-part series, we'll look at the emerging mobile 3D market, several of the most significant hardware developments for mobile 3D and a few of the many ways in which 3D can enhance the mobile experience. In part 2, which will be posted to the Mobilized Software site in the next month, we'll examine a number of key enabling 3D software technologies that make it possible for developers to harness the power of these new hardware devices. The market for mobile 3D is still in the formative stages. In other words, the market is wide open and ripe with opportunity for early adopters. Although it's impossible to predict exactly what forms of 3D content will be the most appealing to mobile users, we can safely assume that many forms of content now available for traditional devices will migrate to the mobile community over time. In particular, the following forms of 3D content are among the many that will likely surface as the nascent mobile 3D market takes shape. Without a doubt, games are driving the traditional consumer 3D market, and it is likely that they will drive the mobile 3D market as well. Only a decade ago, 3D games were a novelty, while 2D dominated the industry, yet today 3D games account for the majority of games sold for personal computers and dedicated consoles (such as Sony PlayStation and Microsoft Xbox). The game industry is so large and lucrative that it is now on par with the movie box-office and home video rental industries, each of which generates revenue in excess of $10 billion annually in the United States. Indeed, a recent forecast by the research group IDC predicts that in the U.S., wireless gaming will generate over $1 billion in revenue by 2006 for wireless carriers alone. At the head of this market are several generations of traditional gamers (pre-teens, teenagers and young adults) who increasingly expect their cell phones, PDAs and dedicated mobile game devices to provide a decent 3D experience. Although the past crop of mobile games has been restricted to two dimensions, today's devices are finally capable of rendering three-dimensional content. Nokia's innovative N-Gage (http://www.n-gage.com), for example, is a mobile device created with 3D games in mind. Although mobile 3D devices such as N-Gage can't compare to today's traditional computing devices in terms of visual quality and speed, the cream of the crop are only a handful of years behind personal computers (in terms of 3D capabilities) and are already approaching the quality of many Web-based 3D games aimed at the mass market. Figure 1, for instance, shows several Web-based 3D games now available at Web3DGames.com (http://web3dgames.com) that illustrate the graphics quality now possible on high-end mobile devices thanks to hardware acceleration and advanced 3D software standards. Although the games shown in Figure 1 are currently available only through a traditional Web browser, they nonetheless give us a good idea of the visual quality that we can expect for 3D games that will soon be pouring into the mobile market. 3D has been used to visually enhance Internet- and Web-based text chat systems for years and is finally becoming a viable business as successful 3D chat systems such as Portal Worlds and Second Life at Web3DChat.com (http://www.web3dchat.com) take off. 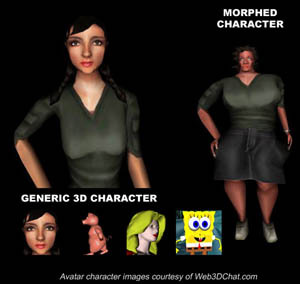 Although hand-held mobile devices aren't yet powerful enough to render the complex chat environments featured at Web3DChat.com, many of today's mobile devices can display simple synthetic 3D characters such as those shown in Figure 2 and Figure 3. Although text-based chat and instant messaging dominate non-voice communications for mobile users today, the technologies described in this series of articles can enhance otherwise lifeless communications applications with 3D virtual faces and characters that can visibly express emotion through facial gestures and body language. Figure 2 and 3 Caption: Mobile 3D graphics can be used to enhance chat and instant messaging applications with synthetic faces and characters that can visibly express emotion through facial gestures and body language. With bandwidth-constrained devices, such as mobile phones, even low-quality streaming video can completely saturate the available network pipe. If you also take into account the fact that traditional video is viewed from a fixed viewpoint that can't be changed by the end user (you can't, for example, walk around a kitchen table or interactively examine objects in the scene from any perspective), it quickly becomes clear that video falls short of the mark for many product and data visualization applications. In many cases, bitmap graphics and even vector graphics prove inadequate for product and data visualization. Interactive mobile 3D technology, in contrast, is ideal for low-bandwidth applications in which end users require the ability to change their viewpoint of the scene and examine objects at will; mobile devices simply render the scene or object in real-time from whatever perspective the user chooses. This capability, in turn, gives 3D a significant advantage for applications that demand a high degree of user interaction. Although full-blown architectural walk-through applications aren't likely to surface for the mobile world any time soon, visualization of comparatively simple and discrete scenes and objects is now possible. Vehicles, household appliances, children's toys, consumer electronics and similar content are ideal candidates for interactive mobile 3D. Likewise, data that lends itself to visualization in three dimensions is a promising area for mobile 3D. Although 2D bitmap graphic and vector graphic technologies will continue to power the lion's share of advertising applications for both desktop and mobile computing devices, 3D will likely become a niche player for specialized forms of advertisement that benefit from the added dimension of depth. So-called "advergames" deliver product advertisements disguised as games and are increasing being developed in 3D to reach young adults and a growing gaming community that now expects digital entertainment to come in three dimensions. In addition to the added dimension of depth and high levels of interactivity that are the hallmarks of 3D experienced through a computer, real-time 3D technology can also provide a substantial savings in storage and bandwidth that can't be matched by bitmap graphics or video. Similar to vector graphics, which is typically rendered in real-time, interactive 3D technologies are typically very compact and efficient considering the rich content that they can represent. Recently, for example, my company created an animated 3D logo for a client advertisement project. When stored in a 3D file format (X3D, in this case) the logo file weighed in at less than 35K, yet looked and behaved exactly as the client required. When stored as a series of bitmap images or a streaming video file, however, the animated logo was massive by comparison: It tipped the scales at several megabytes in size. Even worse, a number of subtle and important visual aspects (such as glints, highlights and reflections generated by multiple light sources that illuminate the logo as it spins about the vertical axis) were lost due to compression and color palate limitations that we had to impose in an effort to keep the non-3D renditions of this project down to a reasonable size. At high quality mode the non-3D versions each exceeded 50MB in size, standing in stark contrast to the tiny X3D file. Although it's highly unlikely that 3D will overtake 2D as the underlying technology that fuels the bulk of mobile advertisement applications, there will almost certainly be a segment of the market that embraces 3D for special purpose advertisements. Cellular telephones and hand-held personal digital assistants are multi-purpose computing devices for which 3D content will simply be one more feature, but not necessarily the most important feature (a cell phone, for example, will be used primarily as a phone by most people). Because the combined market size of cell phones and PDAs is massive, however, the financial opportunity for successfully deploying 3D hardware and software to this segment of the market is also potential massive. Consequently, there is a lot of activity surrounding the enabling hardware and technologies that are necessary to enable 3D on cell phones and PDAs. The list of companies leading the charge for 3D software standards that run on mobile hardware reads like a who's who of the industry: Nokia, Motorola, Sony Ericsson, Cingular Wireless, France Telecom, Intel, Symbian, ARM, Qualcomm, ATI, 3DLabs, Sun Microsystem, SGI, Texas Instruments, Panasonic, Mitsubishi Electric and Epson are just a few of the big names behind the mobile 3D software standards that we'll examine in part 2 of this article. Although the most significant advances in 3D mobile hardware are yet to come, some cell phones and PDAs are already shipping with enough raw horse power to deliver a decent 3D experience today. Nokia's Web site, for example, proudly displays a video of a 3D snowboarding game running on an off-the-shelf Nokia 3650 cell phone (http://www.nokia.com/nokia/0,8764,5400,00.html). Although not a barn-burner in terms of rendering performance or visual appeal, this demo gives us a glimpse into the future of gaming on mobile devices. The future will be full of interactive and highly visual 3D content powered by a new crop of hardware accelerator chips such as the IMAGEON line of multimedia and graphics co-processors created by ATI Technologies. Similar 3D hardware accelerators for the mobile market are now available, or soon will be, from major players in the graphics chipset industry and startups alike. A coming generation of cell phones and PDAs will boast 3D hardware rendering capabilities courtesy of Intel, nVidia, ATI, PowerVR, BitBoys and others in this space. Whereas gaming and other forms of computing related to 3D content are not the primary focus of cellular phones and PDAs, a relatively new segment of the mobile device industry takes direct aim at the gaming community. Nintendo's GameBoy and Nokia's N-Gage devices, in particular, are blazing the interactive 3D gaming trail. Although it's tempting to dismiss mobile gaming as a niche market, the numbers tell an entirely different story. The GameBoy product line alone has sold over 100 million units worldwide. And the size of this opportunity keeps growing, especially as the lines between mobile gaming, cell phones and PDAs continue to blur, which in turn provides software developers with a wider range of applications to build and sell. For example, although the N-Gage is billed as a "game deck," these devices also sport a built-in mobile phone and Web browser, as well as the ability to be extended with mobile Java applications such as calendars, appointment managers, and so forth. In order to ease the burden of software developers who will build 3D applications for mobile hardware devices, the industry has spent the past several years developing a suite of enabling software standards. In part 2 of this series, we'll examine the Extensible 3D (X3D), OpenGL ES and Mobile 3D Graphics APIs that are leading the charge toward 3D for mobile devices. Aaron E. Walsh is Director of the Web3D Web (web3dweb.com) and Media Grid (mediagrid.org). He can be reached at www.MediaGrid.org/people/aew/.